Less than 3% of new homes built today are truly custom built. The process of a true custom home is the product of the client, builder and architect working together. For clients who have the vision and desire, a true custom built home helps fulfill a lifelong dream. We believe the most successful building projects result from a collaborative working relationship among client, architect and builder. Respect, trust and open communication are key elements to a strong working relationship throughout the building process. As clients communicate their ideas and needs for a home, we work with them and their architects to create a detailed construction plan and schedule. By the time we talk to a client, he or she may already have purchased land and even have a design in hand. If not, we can put clients in touch with local realtors to help find land and architects we work with to help design their home. This is the first physical work of the project. This is also the stage where we consider the location and position of a new home or structure. We consider drainage, waterways, the aspects of shading - which trees and plants that will remain and solar considerations. Solar considerations are important at this time. The client may also consider a landscape architect or exchange ideas with us about the long-term use of the land, including removing invasive species, restoring native grasses, or how to put land in conservation easement. After the site prep is completed, we pour footings, build walls and waterproof the home’s foundation. Next – and often an exciting stage for the homeowner – we frame the walls, and window and door openings. We work with clients to select the most energy-efficient doors and windows that also retain the timeless look of the home. At this point, clients are able to walk around the rooms of their homes for the first time. Once the walls are up, we begin the intricate work of installing the inner workings of the home, including heating and air-conditioning, plumbing, electrical, and other communications systems. We want what is installed behind the walls to look as pristine as the finishes a client sees every day. At this point, we install premium insulation to reduce the long term energy cost of owning the home. 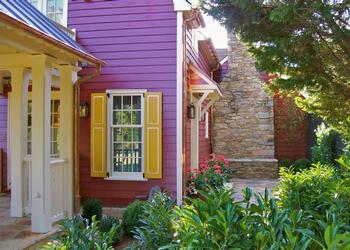 E. Fletcher Construction uses many of the available regional and local materials to achieve a timelessly crafted home. We also believe in using reclaimed architectural salvage, such as reclaimed beams or interior doors, to add unique features to the home. Using specialized tools, our craftspeople can create historically accurate moldings and finishes, or replicate the architectural details of past eras. Most of our moldings are made using local materials and milled in our own shop.